PES Energize customers entering the lobby after hours now have a new way to pay. 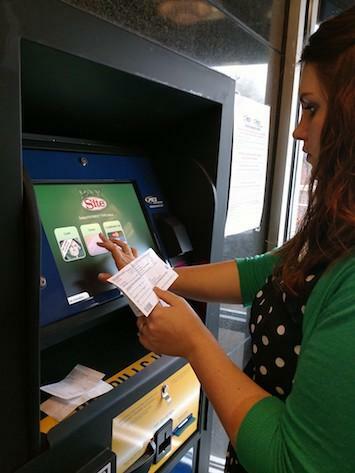 The night drop box has been replaced with a PaySite® Kiosk. The PaySite® Kiosk is a secure and convenient way to pay a PES electric or PES Energize broadband bill around the clock. Customers now have the choice of using cash, check, debit or credit cards. Payments are immediately posted to the account and a receipt is printed once the transaction is complete. Beginning the process is as easy as touching the screen. A friendly voice greets and talks customers through the transaction. Once the User Agreement is confirmed, simply select which bill to pay. PES and PES Energize payments must be submitted as separate transactions. A scanner is available to read the bill. Account numbers need to face to the right so the kiosk can read the bill. If an error with the scanner is encountered, enter the account number on the touch screen to proceed. The kiosk will display the current amount due on the account. Enter the last name on the account. PES recommends the phone number and last four digits of the social security number or birth date are entered when asked. In the event there is a problem, PES can easily contact the customer to get it resolved. A customer can still make a payment even if that information is not entered. If the phone number and social security information are not readily available, enter all ones (1). The PaySite® Kiosk recognizes PES and PES Energize account numbers. 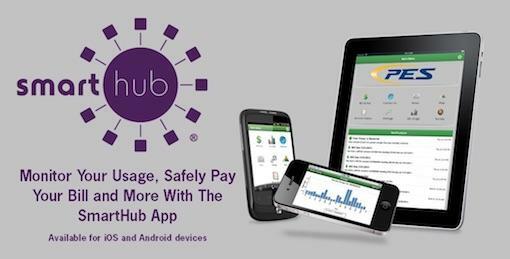 Account information is also available on the SmartHub app. A friendly PES customer service representative will gladly provide a card with this information during office hours. Depending on the payment type selected, the PaySite® Kiosk will present a disclosure. The kiosk DOES NOT give back change or accept coins. Additional payment submitted will be credited to the customer’s account. PES reminds customers once the transaction is completed, a refund of the additional payment cannot be issued. Larger bills should be deposited into the kiosk first. Notice the dollar amount changes on the touch screen as each bill is entered. Once the finished button is pressed, a receipt will be printed and the account will be credited. The kiosk does not accept money orders. Money orders can only be accepted when the front lobby is open Monday through Friday 8:00 AM to 5:00 PM. Another convenience is never filling out another check! The PaySite® Kiosk does this for you. Once the amount to be paid is entered, select “Enter.” The numbers must be facing up and the check lined up so that the numbers are facing right. The check is returned and the receipt is printed when the transaction is complete. Payment by Visa, Discover or MasterCard credit or debit cards is accepted once the payment amount has been entered on the touchscreen. Like cash and check payments, a receipt is printed at the end of the transaction. Contact our office at 931-363-2522 during regular business hours to report any problems.